The BDH2000L Platinum 20-Volt Cordless is on the high end of Black & Decker’s cordless hand vacuum range. Some have called it a “Dyson wannabe” because of its design and cyclonic technology, but it’s sold for less than half the price of similar Dyson vacuums. Let’s look closer and see what Black and Decker is going for with the Platinum. This vacuum is definitely one of the strongest handhelds available, clocking in at 20 volts. When combined with that spiraling cyclonic air action and a relatively narrow nozzle, that’s a lot of strength concentrated in a pretty small vacuum. Those three aspects combine to make for a vacuum that’s impressively good at cleaning – whatever you put in front of its nozzle is going in, and that’s that. Something to consider, however, is that because of the nozzle’s narrow muzzle, it’ll take a bit longer to clean larger surface areas like some furniture and stairs…it’ll definitely be dust and debris free in the end, though! All that power and suction would go to waste if the Platinum were too clunky and heavy to use. Luckily, it’s anything but that – Black and Decker designed it with a handle placement to the rear and top of the body. That makes it easy to hold the vacuum with a very relaxed grip; it can almost dangle from your hand as you clean. Also, its nozzle rotates so you can maximize the efficiency of the nozzle shape even in tight situations. This vacuum is well named especially in terms of its battery and charger. Lithium-ion is platinum-quality, top of the line for batteries, and the charging plate that it rests on only charges the battery when necessary, saving both electricity and battery life. It charges six times as fast as older-style batteries, and there’s an indicator light to tell you when it is ready. On top of all this, the Platinum will run even when used for up to half an hour, and without any fade in power. The Platinum weighs a fantastic 2.89 pounds. That’s incredibly light considering the level of power and suction that it offers – when I said above you can hold it with a relaxed grip, I really meant it! The filter in this vacuum is on the high end of relatively standard – it’s a triple-layered system, and you can wash it in the sink. 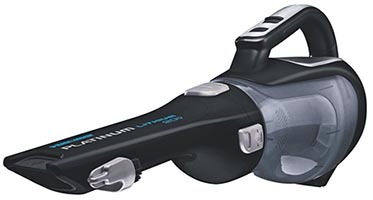 The Platinum comes with a 20.7 ounce dust bin – you can see that it’s pretty large not only because it seems to form most of the vacuum, but also because you can see the large amount of mess you can fit into it because it’s translucent. It’s also easy to empty – just pop off the nozzle of the vacuum. One might glance at this vacuum and assume it doesn’t come with any accessories, which doesn’t bode well for a handheld trying to put itself out there. But look again! The accessories are actually integrated into the vacuum itself – a brush for dusting and delicate surfaces flips up, and a crevice nozzle extends out from the main nozzle. There’s no way you can lose these accessories! The Platinum’s lithium-ion battery and smart charger go a long way towards extending the life of this vacuum – the battery’s lifespan won’t be burnt out by pointless charging. The vacuum itself is well made despite how light it feels – it’s a Black and Decker, after all. Black and Decker also provides a three year warranty for the Platinum, a year longer than the average for handhelds – they know how long their quality will last. The Platinum is priced in at the lower end of the more expensive of handheld vacuums. It might seem like a bit much, but if you compare it to something like a Dyson, you’re getting similar features for quite a steal. The Platinum isn’t so much a Dyson-wannabe as it is a great alternative to much, much more expensive Dyson vacuums. It’s got a one-two punch of outstanding power and a lithium-ion battery, and then follows that up with a surprisingly light weight and a smart charger. If you’re looking for a vacuum that’ll definitely give you more than you’re paying for, look no further – get the Platinum.